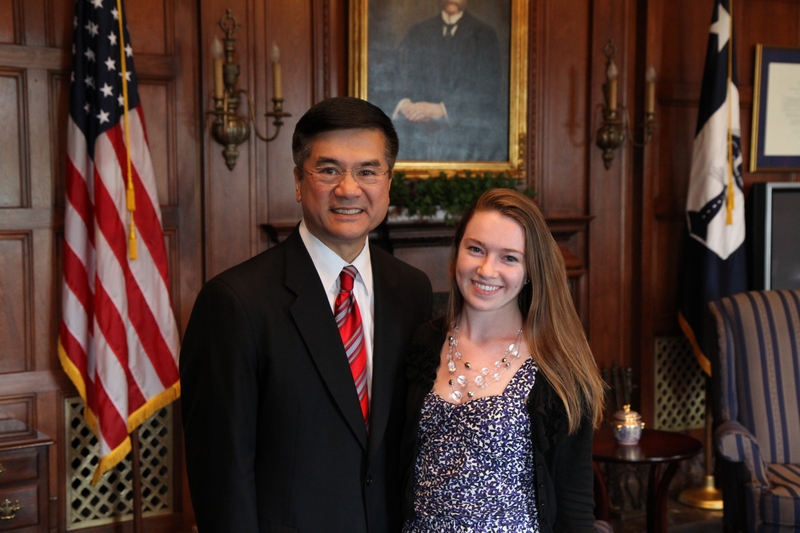 Carrie Bevis is an intern in the International Trade Administration’s Office of Public Affairs. She is a second-year student at the University of Virginia. Initially, waking up at dawn every morning during my first summer vacation from college to metro across the city for an unpaid job hardly sounded appealing. Though, I soon discovered that the excitement of being an ITA intern (and an occasional cup of coffee) were enough to make me jump out of bed every day to arrive early. As an intern in the Office of Public Affairs at ITA, I’ve been exposed to a myriad of experiences, faces, and assignments. Apart from a nifty name-badge and a soon-to-be framed photo of the departing Secretary Gary Locke and me, the ITA intern network gave me hands-on experience in the behind-the-scenes work, while I loaned an extra hand to the hard-working employees. I spent the first couple weeks of my internship taking on simple tasks for the friendly folks in my office. By the third week, my colleagues started to trust me enough to give me bigger and better assignments. I soon became engrossed in the work as I took on projects that allowed me to interview other offices, visit related agencies, and write blogs about my experiences – much like this one. Most of all, my time spent here was enlightening. In macroeconomics class, we learn that voluntary trade helps both sides. Sounds simple, right? Wrong. Working in the Office of Public Affairs, I’ve taken calls from reporters and constituents, sifted through months-worth of trade-related articles, listened to senior staff prep for testimony, and sat through FTA mark-ups on the Hill. On the world stage, you deal with egos the size of countries, literally. So naturally the work of ITA employees is fraught with battles that they intend to win for the U.S. But if anybody can tactfully navigate the issues that arise while effectively serving U.S. interests, I believe it is the ITA employees. They’ve all shared their frank experiences with me. I’ve spoken with the Secretary upstairs and I’ve chatted with the commercial service officer in Montana. I interviewed trade specialists in the Office of Textiles and Apparel and e-mailed with members of the Office of Travel & Tourism Industries. I’ve called the commercial service officers in Pennsylvania, received advice from the deputy under secretary, even traveled with other interns. Absolutely everyone I talked to was enthusiastic and devoted to the work they do for ITA and gave testimony to the rewarding nature of the job. Fuzzy feelings aside, these people mean business and they’re after results that will benefit the American people. The Department of Commerce is on target to achieve President Obama’s National Export Initiative (NEI) to double U.S. exports by 2015. Murmurs of NEI practically echo down the hallways of the ITA headquarters as employees work to increase American exports by ensuring fair trade, increasing U.S. companies’ competitiveness, and helping companies navigate foreign markets. As ITA helps U.S. businesses tap the 95 percent of consumers outside our borders, they’re opening up new and better job opportunities for the 9 percent of unemployed Americans at home. If you’re interested in the incredible opportunity that I had, you can apply to intern at the Department of Commerce by visiting http://www.commerce.gov/node/12814 . I’m proof that you don’t have to have connections to land a government internship. All you need is enthusiasm, persistence, and a will to help the American people. Working from within the office of Public Affairs, I feel like I’ve seen it all first-hand. My eyes have grown wide in surprise at the happening on the Hill, narrowed as I combed through a world’s worth of articles, and focused on whomever exciting new government figure I happened to meet. But on my last day, I never expected them to get slightly bleary as I hugged my colleagues goodbye.